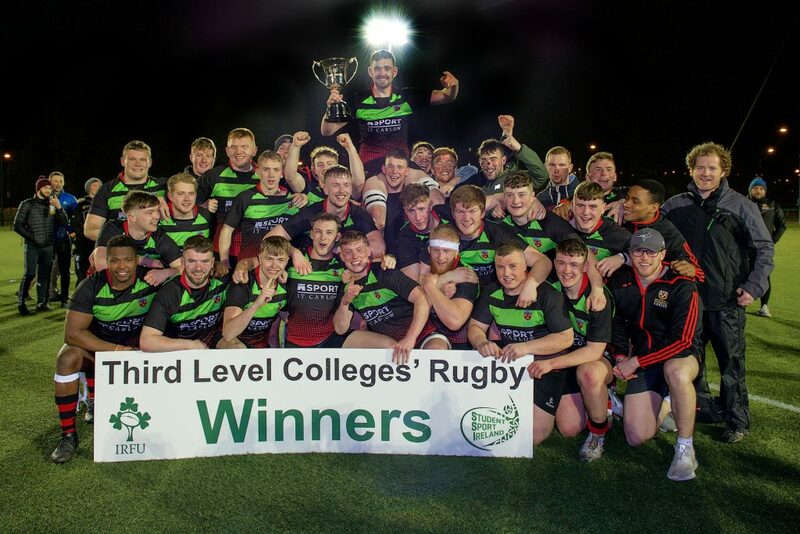 IT Carlow powered their way to a second Student Sport Ireland / Irish Rugby Football Union Brendan Johnston Cup title with a four try to one success over Athlone IT in University of Limerick on Wednesday March 20th. The foundations for the victory were laid in the opening half as the Carlow side lead 18-3 at the interval. Nick Doyle and Sean Flynn exchanged early penalties for their respective side before midway through the opening half Darragh Murphy touched down for the opening try of the game that was converted by the deadly accurate Nick Doyle. IT Carlow built on that try with a second penalty of the half by Nick Doyle, but better was to follow as a second try of the half put them fifteen points in front as the pack barged over for a great forward’s try. IT Carlow pushed for home in the second half and the strength in depth was showing with their third try coming from Callum Murphy and again Nick Doyle did he honours from the conversion for a 25-3 lead. To be fair Athlone IT who qualified for the final by defeating last years winners Garda College in the semi final began to fight back and were rewarded with a fine try by Harry O’Reilly. They almost had a second try when they broke upfield at pace, but Sean Flynn knocked on with the try line at his mercy. One wonders would a real comeback has been catalysed by that missed chance. 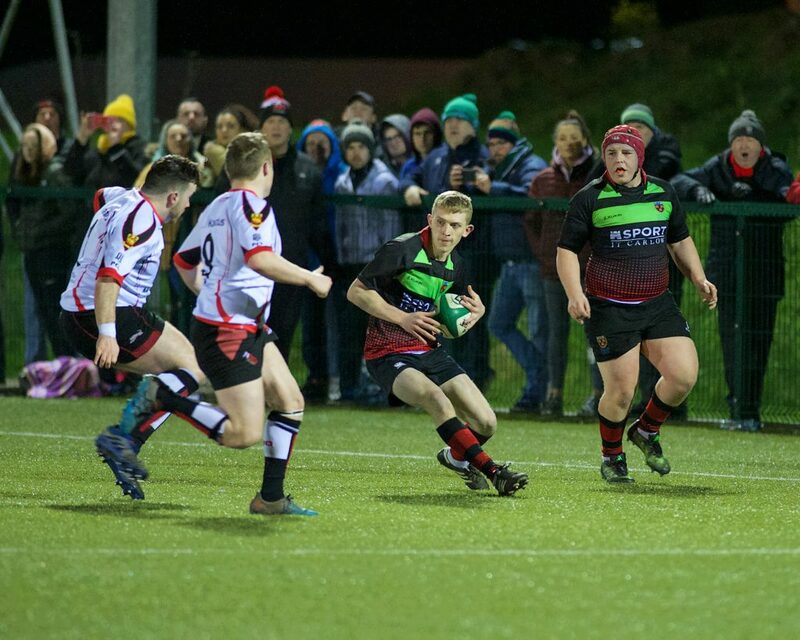 IT Carlow regrouped before the end and the worthy winners on the night sealed the deal with a fine try as Callum Murphy crossed over despite his side being down to 13 players due to two sin binning’s at the time. Carmel Lynch (SSI Chairperson) and Brendan Johnston presented the cup to the IT Carlow captain Joe Carley to great scenes of celebration at the end. IT Carlow – Greg McGrath, Ben Devlin, Ntinga Mpiko, Joe Carley (Captain), Keith Melbourne, John Murphy, Conor Smyth, Darragh Murphy, Issac Daly, Rhys Davies, Calum Murphy, Nick Doyle, Pat Connors, Calum Finnegan, Graham Brennan, Shayne Fleming, Martin Mulhall, Sean Murphy, Darren Madden, Daniel Nemec, Harry Donnelly, Daithi Murphy. Athlone IT – Kevin Gavin, Ethan Preston, Mattie Murphy, Sam Krupa, Jason Howley, Harry O’Reilly, Darragh Maher, Brian McDonnell, Gianluca Monticone, Cathal Evans, Bradley Nealon, Aaron Whyte-Martyn, Alex Porter, Ross Murphy-Sweeney, Sean Flynn, Cormac Coffey, Cedric Fokam, Trevor Philips, Eoin O’Reilly, Ethan Griffiths, Robert Teape, Gavin Kelly, Conor McMahon, Kristian Jocher, Conor Maguire, Liam Chalkey, Samuele Bianco, Conor Watt, Stephen Pyke, Rian Donnellan.